Looking for a film release form template? We’ve got you covered. From release forms for film to talent release forms for video, we’ve got all film release form needs covered. You can modify this film & video release form template to suit your needs and add your own film title, logo, or special clauses as needed. (Note: These release forms are for actors. Are you making a documentary or other nonfictional video? Find our documentary release forms separately here). Why are film film release forms necessary? Filming release forms are very important because they establish a binding agreement between you (the filmmaker or producer) and the people you shoot as part of your film or video. Talent release forms provide you with proof that you got permission, that you own the rights to the resulting footage, and establish what terms you’re operating under (i.e. if your actors or talent are being paid or not and if so how much they’re getting paid). Lawsuits in indie filmmaking are not terribly common but they’re also certainly not unheard of either in the world of indie filmmaking, so getting a signed release form from all your film and video participants is an important step toward getting all your legal ducks in a row. It’s also important to understand the different sections of a film release form, so as a part of this downloadable form template kit we’re also including a legalase cheat sheet that explains what each privision means in case you get asked about it by the person you’re filming. (Nothing is worse than being asked what something means on your own form and not being able to explain it!) We haven’t found any other film release forms on the internet that offer this explainer, and we think it’s super important to have. Who needs to sign release forms for film? Different film distributors and broadcasters have different release form or documentary waiver requirements. Generally speaking, you will want to get a release form from anyone in your film or video that is recognizeable. If you’re shooting in a public place and there are unrecognizeable people crossing the street in the background that probably isn’t of concern to you, but if you’re hiring extras/background actors you should definitely get release forms signed from them. Overall, we’d argue that it’s always better to be safe than sorry when it comes to getting signed release forms. And that any release form a person signs is better than no release form at all. What are the different types of talent release forms for film & video? Filming release forms come in two standard flavors. Below we’ll explain they’re for and how they work. Not all films will need all forms. This is the most common type of release form that filmmakers use. It covers general purpose video shooting and is signed by actors in an indie film or other type of fictional video. We’re including standard talent release forms in this downloadable release forms kit. In the US at least, people under the age of 18 aren’t considered adults so they can’t sign legal documents on their own behalf. If you have minors in your footage, you’ll need to get their parents or guardians to sign this special release form on their behalf. We’re including release forms for minors in this downloadable release kit. 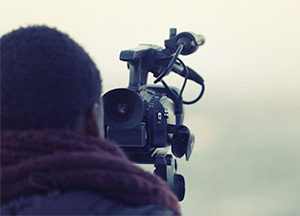 If you’re shooting a documentary film or another type of nonfictional video, a generic talent release form for actors may be less appropriate. You may instead choose to opt for using a documentary release form instead. 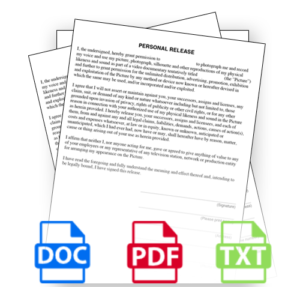 We offer downloadable documentary release form templates separately. Generally documentary film subjects are not paid for their participation, whereas actors or other types of talent often are. When should you get a fim release form signed? We suggest getting your talent release form signed by your “talent” or actors before you even begin shooting, ideally before your first shoot day. That way if there are any questions or misunderstandings you can iron them out before you’re on set and spending $X per minute and need to make the most of your time. 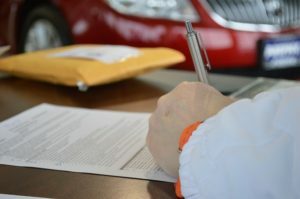 Ideally you probably want to get your filming release form signed before you even set foot on set, perhaps in a table read or pre-production meeting. What circumstances are these film & video release forms good for? Some films may need special language added to their talent release forms depending on their subject matter (and some broadcasters or film distributors may have their own in-house forms that they want you to use). We’re not responsible for any legal issues arising out of the use of the sample release forms that we provide as a reference. Although forms like these have been used in tons of films without problems, you should always consult with an entertainment lawyer before putting these documents to use.